Missing church bell, which used to hang from the tree at the church gates. This photograph was taken in about 1947. Not perhaps of immediate interest to most, but my interest was aroused when I read that one Balfron church bell was apparently cast in 1791, and the other in 1888. 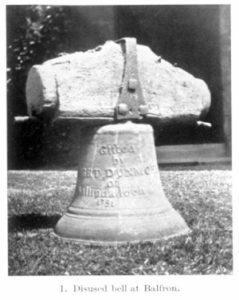 The book notes that there was, before the church was rebuilt in 1832, a bell tree at the churchyard gate. The bell is probably the work of John Wilson & Co of 73 Trongate, Glasgow. The manufacturers initials were inscribed inside the bell, which is, apparently a rarity. So, where is this bell?